In last article we have understood about the CMMI and its 2 level. Now in this article, we will see the Level 3, 4 and 5 which is covered under CMMI level. Let’s start with CMMI Level 3. In this level, Organization have already define some set of rules and processes which needs be followed by all the employee of the organization. Thus, Different Group of developers can handle the client with same set of procedures easily. This procedure can provide consistency toward the client too. Client also can work with the different group of employee within the same organization. In define level of CMMI, we can say that specific goal have been achieved by the company. As well define procedures have been understood by each employee of the organization and it have been followed and successful since so many years. Even client have been satisfied with the processes which have been followed by the organization for the projects. This will give a benefit of customer and client relationship too. Now CMMI level 3 and CMMI level 2 have very thin line between them. We have understood in CMMI level 2 that each project have their own procedures and standard to follow. 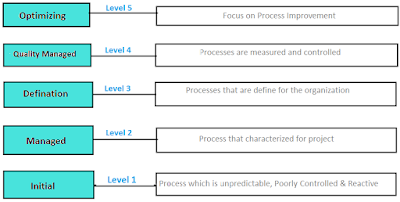 Thus, each individual project have different set of processes But in level 3, we have define that whole organization should have same procedures for all projects. Single project should not have their own set of process and standards. Each project should be followed the set of processes and standard which have been define by organization. This is the main difference between CMMI level 2 and CMMI level 3. Level 3 and level 2 have been described in organization as per their processes and standards but in level 3 each employee have to follow the same procedure so everyone is more clear about the terms and condition for the different projects. This is the main advantage for CMMI level 3 organization. In level 3 of maturity all the rules have been define and managed by taking care for each department like QA, Developer and design team. Thus, all process have been understood and developed with the concepts of the inter relationship maintain. In this level, Quality have been managed after defining the process of the development of an application or project. Here organization have already achieved the specific goals by following rules of level 2 and level 3 so in this level performance of the product have been measured. All the sub processes and techniques have been verified here to check the quality of the product. Quality have been measured by verifying the requirements of end user, client or customers. Even quality and processes have been measured in term of statistics and managed it through out the development life cycle of product. 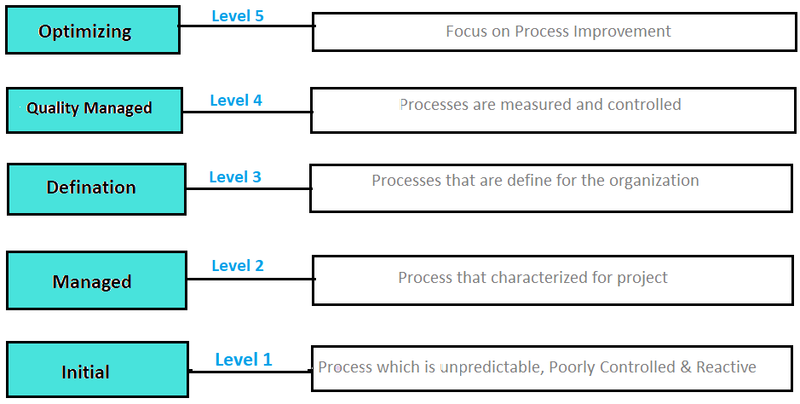 The main difference between level 3 and level 4 is, in level 3 all procedure and standard have been define to follow and that all are predictable but that not define with the thought of statics and in level 4 all the process have been define with the relative statics and performance of the products. Now let’s move to the level 5. After achieving above all levels, company will move to the last level of CMMI which define that all the define procedures and standards must be improved after sometime to improve the productivity and performance of each products or applications. All the specific goals have been achieved as level 2,3 and 4 have been passed but in level 5 , all generic goal will achieved by organization too. Procedures and standards should be improved after all common causes and issues have been found in the older procedures. It leads to the improvement of the performance of the product. All the innovative techniques have been define in this level to improve the rules of organization and main focus of this level is update the old processes with all new phases and features. To optimize the process there are many aspects are taken care. This process will be succeed by involving more employee experience and innovative and agile ideas and objective of organization. There are so many challenges and opportunity have been faced by the organization so accordingly, learning lessons needs to be noted and each process should be improved as per the role assignment in organization. The main difference between level 4 and level 5 are, In level 4 all the rules and processes have been updated as per statics values but in level 5 all rules, procedures and standard have been improved by taking care of performance of the product.